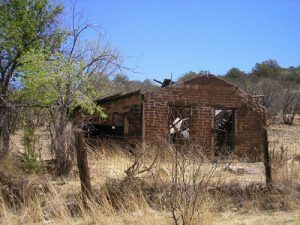 In the early Spring of 2007, we made a ghost town jaunt along the southern border. Glad we did, although we probably shouldn’t have, with at least one border agent questioning our naivete. 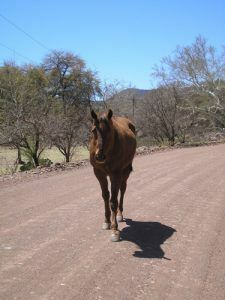 Harshaw Road outside of Patagonia begins with good gravel and is lined with ranches, and obviously horses. Kathy Weiser, April, 2007. 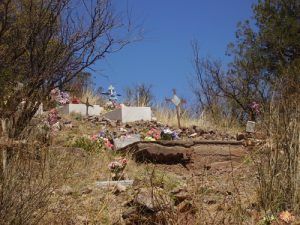 The area southwest of Patagonia, Arizona, all the way to the Mexican border, is lined with ghost towns and mining remnants speaking to more prosperous days. Patagonia, 18 miles northeast of Nogales, on Highway 82, is a small town of fewer than 1,000 souls that, today attracts art enthusiasts and nature lovers. Before you start a trip along the back roads to the ghost towns of Harshaw, Mowry, Washington Camp, Duquesne, and Lochiel, fill up your tank prior to your arrival in Patagonia, as we could find only one open gas station, and its hours are limited. There is a small market in town, where you should stock up on water and snacks before taking what could be an all-day trip. While the road out of Patagonia is good gravel because of the many ranches in the area, it deteriorates the farther you move southward and a high clearance vehicle is recommended. Beware, that this area is rife with illegal aliens and as such, also U.S. Border Patrol. When we visited, we were stopped for a vehicle check (lots of things can hide in an SUV.) But, what we also learned from the Border Patrol Officer is that these back roads are not generally frequented by most tourists because it is also a favored route of drug smugglers. Could be a dangerous place for a day trip. Heading to the first ghost town along this path, Harshaw, you will turn off State Route 82 in Patagonia onto Taylor Avenue, travel one block and turn east onto Harshaw Road. Harshaw lies about 8 miles southeast of Patagonia. Back in 1877, a rancher named David Harshaw was grazing cattle in this area when he discovered a tremendously rich silver vein. In no time, the rancher-turned-miner called his “find” Hermosa, and people began to flock to the area. The town that sprang up around the mine was named for him. 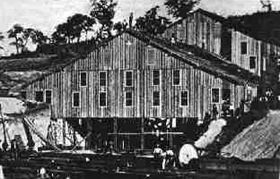 The mine, located due south of Harshaw up a Jeep trail, became the major producer in the area, peaking at more than 350,000 in ore during a four-month period in 1880. However, David Harshaw, by this time, had sold the claim and moved on. The town; however, boomed with some 2,000 people, of which 150 worked at the mine and another 20 at the stamp mill. A post office was established on April 29, 1880, and the camp boasted seven saloons, a boarding house, hotel, miscellaneous shops, and a newspaper called the Arizona Bullion on its bustling mile-long Main Street. This abandoned and tumbling down house was lived in until the 1980s, Kathy Weiser, April 2007. However; in 1887, Harshaw would see a minor rebirth when a Tucson man named James Finley purchased the Hermosa claim for $600. Finley soon revived the mining, but on a smaller scale. The town then had about 100 people. In 1903, two events occurred to kill the town once again – Finley died and the market price of silver dropped significantly. Its post office was discontinued forever on March 4, 1903. Abandoned once again, in 1937, the Arizona Smelting and Refining Company (ASARCO) reopened the nearby Flux and Trench Mines, which brought a few residents back to the area. Asarco continued mining in the area until 1956. Today, there are just a few remnants left of this old community, including the James Finley home, a tin-roofed adobe residence that is still occupied, a crumbling home, and the cemetery. Just south of the site is the remains of the Harshaw/Trench Camp Church and mining remnants. The Harshaw Cemetery, David Alexander, April 2007. 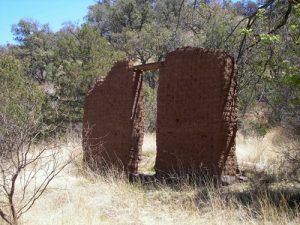 What’s left of the Harshaw/Trench Camp Church, located ½ mile south of the Harshaw cemetery on FR 49 at the intersection with the Flux Canyon Road. Kathy Weiser, April 2007. Continuing on the same road, which is now called FR 49, another five miles or so, is the old town site of Mowry. The site is .2 miles east on FR214; however, we were unable to find any remains other than a few low foundations. 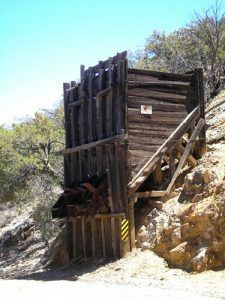 Mining remnants between Harshaw and Mowry, Kathy Weiser, April 2007. Mining here dates back to 1857 when it was worked by Mexicans. However, in 1859, the claim was bought by Sylvester Mowry and renamed the Mowry Mine. Investing heavily in equipment, the mine began to produce, so successfully that it would ship some $1.5 million in ore over the next several years. Rolling in the dough and happy at this investment, Mowry’s bright future would suddenly end in 1862, when he was arrested and charged with selling lead for ammunition to the Confederacy. Sent to Yuma Prison, his mine was sold and his equipment destroyed. Later that same year, he was released for lack of evidence and tried to get the government to reimburse him and return the mine. However, he was unsuccessful and moved on to England, where he died in 1871 at the age of 39. Though the mine was allegedly producing more than $4,000 per week during the time of its seizure, it was only worked sporadically afterward as it passed through a number of hands, and never again made a profit. Though we were only able to find a few foundation remains at the townsite, a rugged road goes north off FR 214 leading to some adobe walls which continue to stand. Beyond them are said to be the mine and smelter site, the collapsed shaft, and a stone powder house. However, this area is on private property, so we did not venture down any of the roads that ventured north.